I live in west Norfolk and do work both for sale through galleries and by commission. 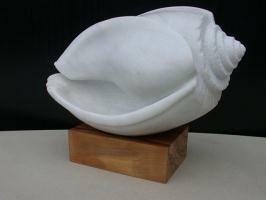 I have carved in wood as a hobby most of my life and converted to stone four years ago. I am self taught in both mediums. 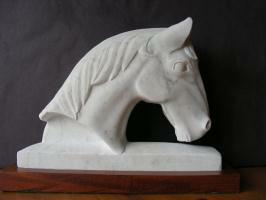 In most of my carving I use Portland or Ancaster stone but also use marble for some subjects. I carve both in the round and in relief and have no ?speciality? subject area, preferring to diversify both in subject matter and style. I have had tuition in letter drawing, layout and cutting from well known letter cutters, Tom Perkins, and James Salisbury. The latter at the London City and Guilds College of Art. 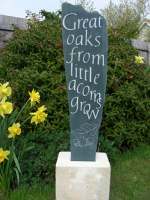 I have worked in various types of stone, including Welsh slate, Cumbrian green slate, various limestones and York stone. All images on this page copyright © Andrew Williams 2018. No images or other content may be used without the express permission of the West Norfolk Artists Association or the individual artist.